According to the Bureau of Labor and Statistics, job openings in the landscape industry now outpace the number of available workers for the first time in history. The shortage is not just confined to installers but is also making its way into the design field as the millennial generation continues its migration towards careers that can be executed in a climate-controlled work environment. Taking a proactive approach, Belgard team members across the country work with various organizations and schools in an effort to encourage more young people to consider careers in the landscape industry. In addition to various local grassroots efforts, Belgard has been a longtime sponsor of two national programs geared at inspiring and facilitating industry success for college students in the landscape and horticulture fields. Organized by the National Association of Landscape Professionals (NALP), the National Collegiate Landscape Competition (NCLC) is an annual three-day powerhouse event that attracts the top horticulture and landscape contractor students from around the country and brings them together with top industry companies, manufacturers and suppliers. Hosted each year on a different collegiate campus, this year’s event will be held March 20-23, 2019, at Colorado State University in scenic Fort Collins, Colorado. The event will include scholastic competitions, student workshops, a career fair and live competitions in design, landscaping, installation, equipment operation, irrigation assembly and more. Having competed at the NCLC himself over 20 years ago, Tim Huinker is now a Construction Specialist and a member of the National Training Team for Belgard and enjoys overseeing the Hardscape Installation competition event each year at the NCLC. For nearly a decade, the Hardscape Installation competition has been sponsored by Belgard or Anchor® Wall Systems, a fellow member of Oldcastle APG portfolio of brands. For the last few years, both brands have worked together to co-sponsor the event, donating materials, creating the design, handling logistics, managing student volunteers to set up the competition plots, and judging the competition. For the Hardscape Installation competition, Belgard and AWS are supplying three semi truckloads of hardscapes, one of the largest donations for any of the competitions. 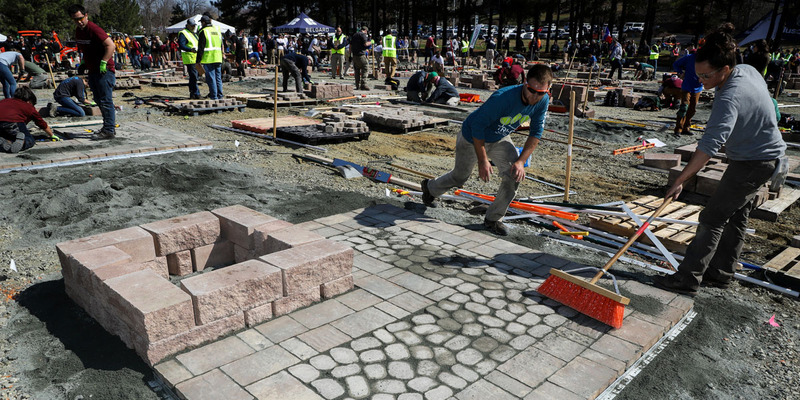 The 1-hour and 50-minute competition between 40 hardscape installation teams from schools across the country will include a Catalina™ Slate paver field with a Belgian Cobble® border and Diamond® 9D freestanding walls. “It’s important to help the next generation of landscape contractors get a good start in their career through education and networking. And it’s encouraging to see the volume of students coming through and to watch the increase in enthusiasm.” Huinker says. For students studying to become landscape architects, LAbash is an annual three-day mecca of education and networking that moves from one collegiate venue to another each year. This year’s event will be held April 4-6, 2019, at the University of Georgia in Athens, Georgia, and will draw future landscape architects from around the country. Sponsored by the UGA College of Environment + Design, LAbash 2019 will include speaker events, workshops and industry networking. The highlight of this year’s event is a real-world design competition to completely overhaul the landscape of nearby historic Roebling Plantation. Belgard provides a monetary sponsorship to help fund the event, provides education support and manages a booth throughout the conference to facilitate networking opportunities, helping to connect students with potential employers in their markets. Belgard also plans to educate students at the conference on the benefits of incorporating permeable interlocking concrete pavements (PICP) into landscape designs for reducing stormwater runoff volumes, low-impact development solutions, water pollution reduction and satisfying regulations on impervious cover restrictions.